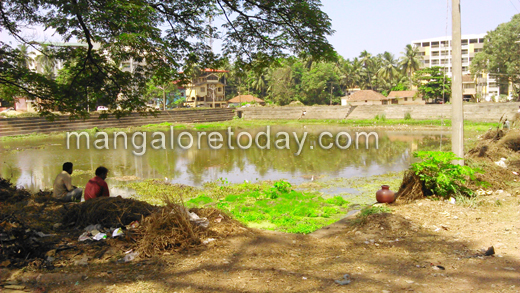 Mangaluru, Feb 22, 2016 : The MUDA - Mangaluru Urban Development Authority, has proposed to rejuvenate waterbodies at Hosabettu, Kotekar, Pilikula and at Pavanje before the monsoon. According to Mohammed Nazir, commissioner, MUDA, the fee was collected while sanctioning approvals for forming housing layouts. The MUDA charged Rs. 1 lakh per an acre or Rs. 1,000 per one cent as tank development fee while approving layouts. The fund should not be diverted to any other activity. A sum of Rs. 2.62 crore, collected by MUDA, is set to be used for rejuvenating waterbodies, at least four for the time being. He said that Tavare Kola at Hosabettu and Kolangere Kere at Kotekar would be dredged and protection walls would be built around them. Works would commence from the first week of March. Tavare Kola is spread on 2.53 acres and it will cost about Rs. 27.5 lakh to rejuvenate it. The Kolangere Kere is on six cents of land and it will cost Rs. 16 lakh for dredging and building a protection wall. Commissioner Nazeer said that there was a mini-tank near the Urban Haat at Pilikula. “It is dried up now. But, water accumulates in it in the monsoon. This tank will be developed by building retaining or protection walls. Works will be taken up to store rain water in it to recharge groundwater in Dr. Shivaram Karanth Pilikula Nisargadhama. The process of bidding to select the contractor to take up this work is under progress. This work will be taken up after selecting the contractor,” he said. The commissioner said that it had also been proposed to dredge and rejuvenate a tank at Pavanje. It was close to the Jnanashakthi Subrahmanya Swamy Temple. The contractor was yet to be selected. Its bidding process was also under progress. All the projects were focused on recharging groundwater. There so many wetlands in Farangipet and Pananbur most of them are filled and construction purpose. People in their craze of development have lacked to save the waterbodies.